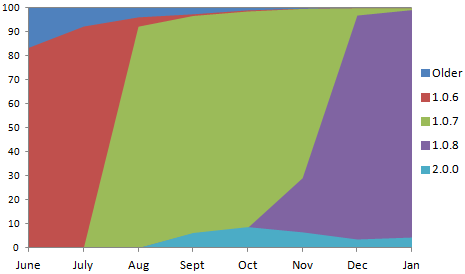 The above chart shows the adoption of each version of the BlackBerry PlayBook each month as seen from downloads of the game Pixelated. Unlike the slow OS adoption on BlackBerry smartphones, the graph shows much steeper slopes for adoption of each new OS version for the PlayBook. January saw an amazing 99.1% of users running OS 1.0.8 (or higher). These numbers should give us a feel for the adoption of OS 2.0 when it is released later this month. In short there will be no reason to support anything earlier then OS 2.0 pretty much as soon as it is released. This data was taken from downloads of the popular PlayBook strategy game Pixelated. Data shown on the chart is from the beginning of June 2011 through the end of January 2012.